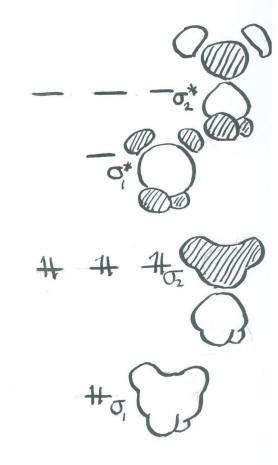 Instead, we look at slightly simplified MO diagrams in which we keep track of the result all those atomic orbitals coming together to make new orbitals. At a very simple level, the qualitative result is always the same and can be roughly predicted based on the Lewis structure. There is a bonding MO for every bond you see in the Lewis structure. These levels are low on the diagram. Every bonding MO has a corresponding antibonding MO. These levels are high on the diagram. 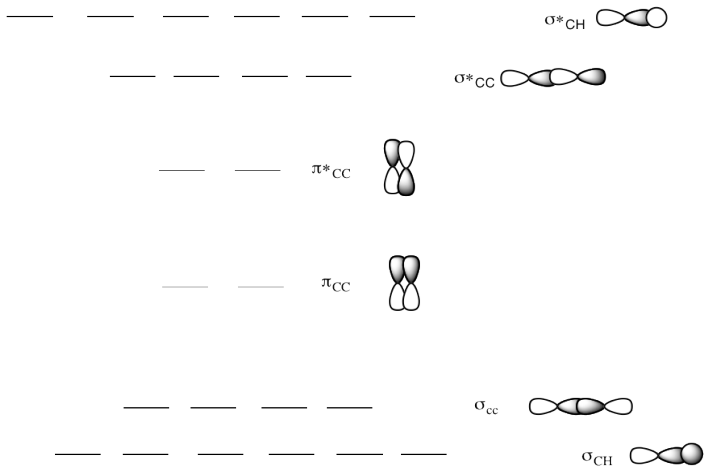 Lone pairs in Lewis structure correspond to non-bonding orbitals. These levels are intermediate on the diagram. The diagram is populated by the same number of electrons that you see in the Lewis structure. a) This is the MO diagram for ethane. Draw a Lewis structure of ethane. Populate the electrons into the MO diagram. b) This is the MO diagram for propane. Draw a Lewis structure of propane. Add in the missing MO cartoons for the different levels. Label the HOMO and LUMO. c) This is the MO diagram for butane. Draw a Lewis structure of butane. What happpens to the MO diagram as the alkane chain length increases? a) This is the MO diagram for ethene. Draw a Lewis structure of ethene. b) This is the MO diagram for propene. Draw a Lewis structure of propene. c) This is the MO diagram for 1-butene. Draw a Lewis structure of 1-butene. d) This is the MO diagram for 2-butene. Draw a Lewis structure of 2-butene. Does the location of the pi bond change the MO diagram? e) This is the MO diagram for 1-butyne. 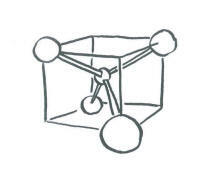 Draw a Lewis structure of 1-butyne. How does an alkyne change the MO diagram? In general, this idea that the geometry around an atom determines what atomic orbitals are needed to form direct (sigma) bonds with its neighbours is closely tied to hybridization. That's the idea that s and p orbitals in the same shell will need to work together to bond to neighbouring atoms. 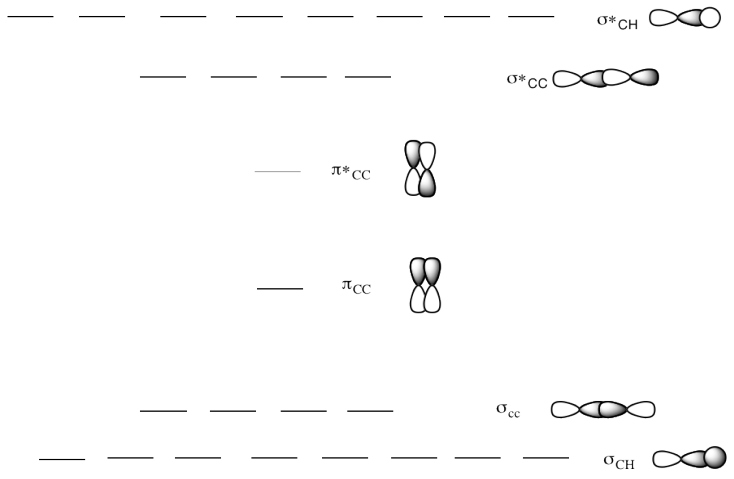 In molecules, we sometimes blur the distinction between the ones that are needed to form this set of bonds, and refer to them instead as "hybrids". 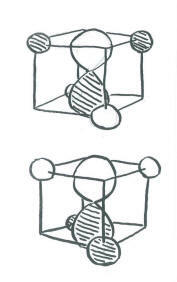 Hybridization is closely tied to the geometry of the central atom, so much so that the terms, geometry and hybridization, are occasionally used interchangeably. a) Use the geometry for BH4- that you would predict from its Lewis structure. b) Select an orientation for the p orbitals on boron. c) What interaction are possible between the set of hydrogens and the boron 2s orbital? 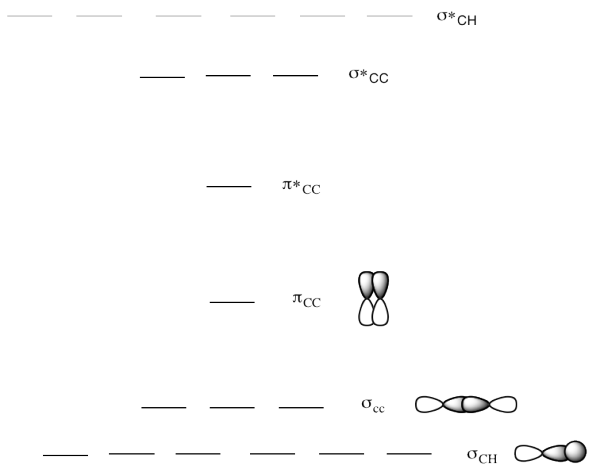 d) What interactions are possible between the set of hydrogens and one boron 2p orbital? e) What interactions are possible between the set of hydrogens and the second boron 2p orbital? 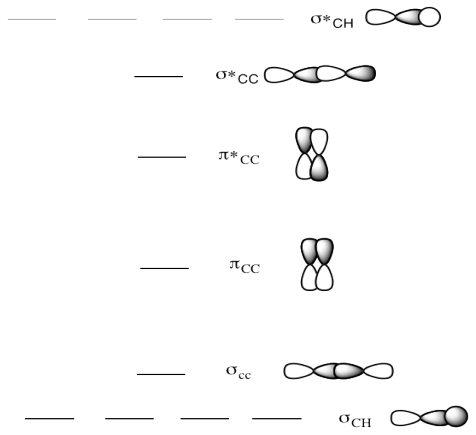 f) What interactions are possible between the set of hydrogens and the third boron 2p orbital? 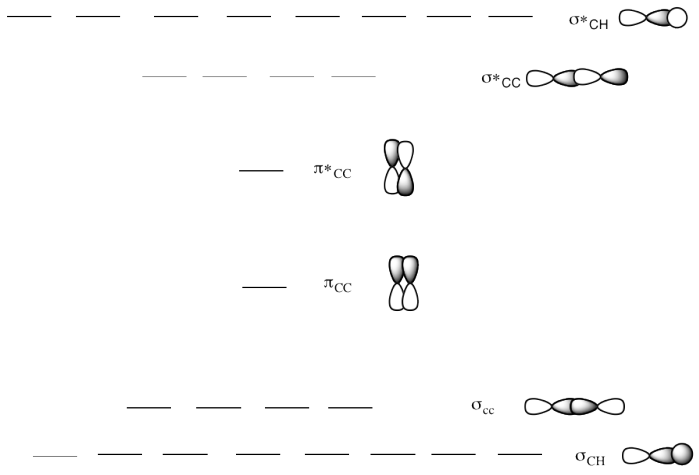 g) Can all the hydrogen orbitals interact in each case? If not, why not? h) Order the resulting combinations in energy, show the resulting energy levels and populate them with the correct number of electrons. a) Use the geometry for BH3 that you would predict from its Lewis structure. a) In one approach, assume the H-C-H forms a 180 degree angle (linear geometry). Only one of the p orbitals lies along this line. b) In a second approach, assume the H-C-H form a 120 degree angle (angular geometry). These three atoms define a plane. 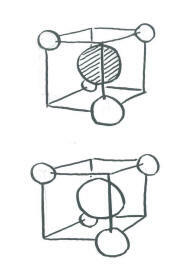 Two of the p orbitals can lie in the plane of these three atoms. c) Based on your molecular orbital energy level diagrams, which of these two possibilities do you think is most favourable?